A study in Israel compared touch and pressure pain on the scalps of people experiencing hair loss with healthy controls. In the people experiencing hair loss, the researchers concluded that pain was more significant in the areas of the scalp that had hair loss, mainly in the upper front and sides. 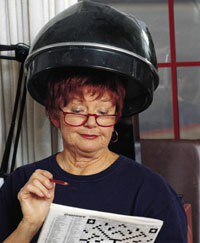 The areas that were not painful were not affected by hair loss (mostly the back of the scalp). The balding sections also had a lower pain threshold than the non-balding parts. Also, the scalps of balding people had a lower pain threshold than the same regions of healthy controls. There was no difference in the threshold for touch between balding areas and areas without hair loss. This research suggests an association between hair loss and regional changes in the pain system. Since the pain threshold in the entire scalp regions of people with hair loss was lower than the controls’ may mean that people with hair loss have a generalized hypersensitivity of nociceptors (hyperalgesia). This entry was posted in Hair Health, Hair Loss on August 31, 2009 by Larry Shapiro.